Nature has given us over a dozen different species of plums, but plant breeders keep providing us even more. Here are some tips to help you select the right plum trees for your orchard or backyard. Plums have been cultivated for thousands of years and were growing wild long before that, probably originating in Eurasia. They are members of the genus Prunus, which also includes peaches, cherries, almonds, apricots, and sloes. The fruits of this genus are known as drupes, or stone fruits. Many of the wild plums and some of the older cultivated varieties are thorny, with tart fruit, which suggests something of the nature of the original plum, probably derived from Prunus spinosa, the blackthorn or sloe. 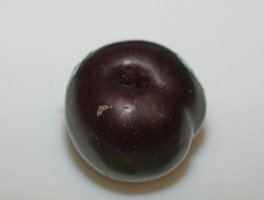 The species cross-breed easily, however, and most of the plums commercially available today are hybrids. Plums are of several types, some used mostly for processing and others for eating fresh. Botanists today do not seem to agree on the precise classification of the plums, but growers usually divide them into three groups: European plums, Asian plums and native American plums, each group including several different species. 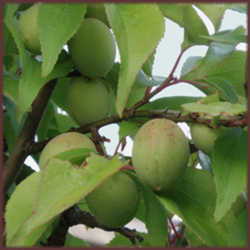 According to some taxonomists, apricots (P. armeniaca) belong in the same subgenus as plums, and breeders have produced several plum/apricot interspecific crosses. 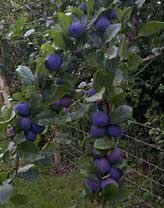 Many people now think of European plums (Prunus domestica) as prune plums, typified by the blue Italian plums, such as the common variety 'Stanley'. These are usually dark blue in color with a waxy bloom, oval in shape, that have a sweet, dry yellow flesh when ripe. The concentration of sugar allows them to be dehydrated for longterm storage as prunes. They are also suitable for jam and other preserves, turning a dark red color when cooked with their skins. Most Prune plums are freestone and self-pollinating. Other varieties often grown today for processing as prunes are 'Fellenberg' and 'French Prune'. Other kinds of P. domestica are the 'Yellow Egg' type, typically used for processing, and the 'Lombard', an oval plum usually with reddish skin, which is eaten fresh. These are less often grown today in the U.S. The 'Green Gage' is a round, fresh-eating plum with green skin and flesh even when ripe, although some varieties can be yellow. 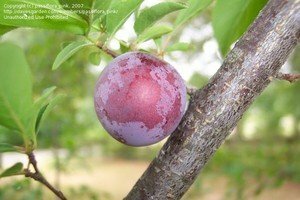 (In England, any kind of plum can be called a "gage", but sometimes the name is used to distinguish fresh-eating plums from prune plums; in France the 'Green Gage' is known as the 'Reine-Claude' and greatly prized as a dessert fruit.) Its sweetness is reputed to be incomparable, and it is considered by many the very best plum for eating fresh. It is a difficult plum to grow successfully, however; it is finicky about soil and weather, the skin is prone to splitting if it rains near harvest, the fruit bruises easily when ripe and is hard to ship. The stone is free, and it is at least partially self-pollinating but does better with another variety nearby for pollination. The 'Green Gage' was once widely grown, but in many places it has now been superseded by other varieties. There are still cultivars available, however, such as 'Bovay'. 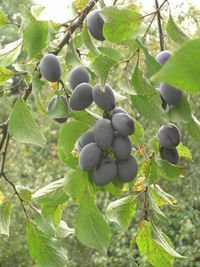 Prunus insititia is a very old European plum, sometimes now included with the prunes as a subspecies, P. domestica var. insititia. The best-known are the damsons, small, tart plums most often made into preserves. They bear a resemblance to prune plums in color and shape, although somewhat more rounded. Most people do not consider them suitable for eating fresh because of the astringent skin and clinging stone. 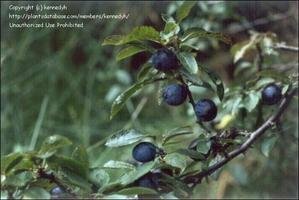 Besides preserves, the most common use for these plums is distillation into plum brandy, such as Slivovitz. South-central Europe is a center of plum production, most of which is distilled. 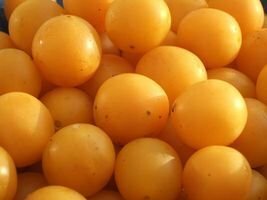 The 'Mirabelle' is a round, yellow freestone French plum, a relative of the damson, sometimes given either the name P. domestica var. syriaca or P. insititia var. syriaca. It is also commonly used for preserves and also for distillation, although, unlike the Damson, it is sweet and suitable for eating fresh. Most Mirabelles are grown in France in the region of Lorraine. These plums belong to the species Prunus salicina (or P. trifolia), though the varieties most common now are hybrids. Although they are often called Japanese plums, they actually originated in China, which grows more plums today than any other country. In contrast to the European plums, most Asian plums are clingstone and not self-pollinating. Typically, they are rounder and more juicy than European plums. In the US, they are most often grown for eating fresh, although they are also quite suitable for jams and jellies, and of course, plum sauce. 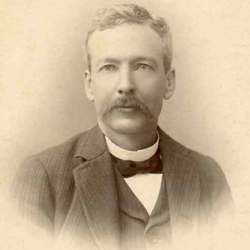 In the late 19th century, plant breeder Luther Burbank imported Asian plums to California, where he cross-bred them with a number of other species, such as the native American plums. The resulting hybrids were highly successful, and even eventually re-exported back to Asia. 'Santa Rosa' is still one of the most common plums grown today. Other successful Burbank hybrids are 'Burbank', 'Wickson', 'Golden', 'Satsuma', 'Shiro', and 'Ozark Premier'. Today, hybrid Asian plums come in all colors from purple to gold. 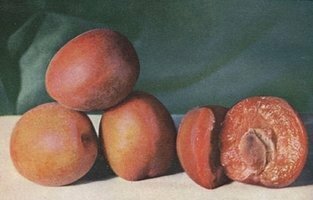 Among Burbank's successful breeding experiments was a cross of Asian plum with apricot, which he named the plumcot. 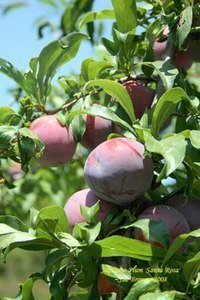 More recently, a breeder named Floyd Zaiger has developed and patented several other interspecific plum/apricot hybrids: the Pluot®, primarily Asian plum, and the Aprium®, primarily apricot. Many people consider the flavor of these crosses to be superior to the parents. Pluots have smooth skin like plums, while apriums are fuzzy like apricots. Pluots need another Asian plum or pluot for pollination, while apriums are fairly self-fertile. Some well-known pluot cultivars are 'Flavor Supreme' and 'Dapple Dandy', which is sold in supermarkets as "dinosaur egg." The best-known aprium is 'Flavor Delight'. Plums are subject to most of the pests and diseases that infest other species of the Prunus genus. The larvae of the plum curculio (Conotrachelus nenuphar), plum sawfly (Hoplocampa flava) and oriental fruit moth (Grapholita molesta) are particularly damaging to the fruit, while the leaves are highly attractive to Japanese beetles (Popillia japonica), and peach tree borers (Synanthedon exitiosa) will attack the wood. Brown rot (Botrytis cinerea) often causes the loss of maturing fruit. Different cultivars vary in their susceptibility to different fungi and viruses, which are prevalent to different degrees in different growing regions. 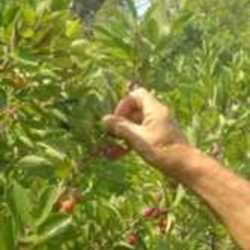 Because this fruit is so variable, the first question to ask when selecting plum trees is: how you plan to use the fruit? Will you be making a lot of jam or jelly? Using your dehydrator to make prunes? Or do you intend to eat your plums fresh? Choose varieties that match your needs and, when possible, cultivars that you already know you like. But be aware that your favorite plum may not be the one best-suited for your growing conditions. Location and climate are very important in selecting plum varieties. Most Asian plums grown in the U.S. come from the West Coast, where conditions are ideal for them, in particular because this part of the country is free from the plum curculio. In general, European plums are better suited to a cooler climate than Asian varieties. Some European plums will thrive in Zone 4, while some Asian varieties can't be grown successfully in Zone 5. European varieties usually require 800-900 chill hours, while typical Asian types only need 500-600; Asian hybrids have similar requirements. Like apricots, plum/apricot crosses are susceptible to crop loss from late frosts, as they tend to flower early. 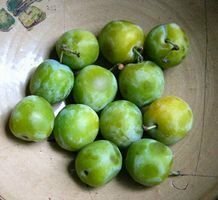 Greengages and many other plums prefer their summers hot and dry; humidity tends to promote the development of fungus disease. If possible, select plums that have been known to flourish in a climate similar to your own. Your local extension service can recommend varieties best suited for your region. If a particular pest or disease is common where you live, look for resistant cultivars. If you are considering grafted trees, which includes most varieties, be aware that different rootstocks are considered better for different growing conditions and soil. If possible, try to find out what rootstock is best suited for your conditions. Many European plums have a long growing season and aren't ready to pick until late September, while Asian plums and hybrids may ripen in July or August. People who plan to process their plums may want them ripening all at once, but for fresh eating, it might be a better idea to plan for a succession of ripening fruit, as plums do not keep well once ripe. For many uses, people often prefer freestone fruit to clingstone, and, in general, European plums tend to be freestone while Asian plums are clingstone. But with this, as in many other factors, there are exceptions. When any factor is important to you, be sure to check the specifications for the variety you are considering. Another factor to be considered in selecting plum varieties is self-fertility, particularly for those persons who only have room for a single tree. In general, European plums are self-pollinating while Asians are not, but hybridization has produced a number of self-fertile Asian plums, including the popular varieties 'Beauty', 'Hollywood' and 'Methley'. Another possibility for people with limited space is a grafted tree containing two or more varieties that can pollinate one another. Always keep in mind when selecting plum trees that generalizations cannot be relied on absolutely and there are always exceptions, largely as a result of the extensive hybridization among the Prunus species. Before you make your choice, research every aspect of the particular cultivar you are considering. Plant breeders have probably created a plum that is right for your orchard and your needs, and all you have to do is find it. Mirabelle and Damson: Permission is granted to copy, distribute and/or modify this document under the terms of the GNU Free Documentation License, Version 1.2 or any later version published by the Free Software Foundation; with no Invariant Sections, no Front-Cover Texts, and no Back-Cover Texts. A copy of the license is included in the section entitled "GNU Free Documentation License". Italian Prune: This file is licensed under Creative Commons Attribution 2.0 Germany License. Luther Burbank: Wizard of Horticulture Umeboshi 梅の実 Plum Going to the beach to pick plums?... YES, Beach Plums! !